Another stimulating Rural Housing Scotland conference last week threw up countless options for blogging. Evidence shows ’rural’ affordable housing investment is tending to end up largely in urban settlements. Are homes built in Inverness, or Ayr, or Dumfries truly rural? There was much talk of rural housing ‘enablers’. We need more and better support for the Small Communities Housing Trusts and Rural Housing Scotland as catalytic agents, driving the complex process of converting aspiration into buildings on the ground. This often missing link is critical to the evolution of a more rapid delivery of new rural homes. Could hutting begin to reduce holiday home ownership by providing a cheaper, more fulfilling and sustainable alternative? One Council planner didn’t think so, saying “we don’t support hutting”. That sits uncomfortably with the Scottish Government’s Scottish Planning Policy, which DOES support huts (not to mention their rewriting of the Building regulations to the same end). We heard that the land reform agenda is offering more rural-focused opportunities for communities, as well as driving more active land management and sustainable development by current landowners. Meantime, the Islands (Scotland) Bill is steaming ahead, bringing ‘island-proofing’ to the table. Is ‘rural-proofing’ next in line? My own input was driven by the Planning (Scotland) Bill, which is currently working its way through the system. Planning CAN be catalytic, transforming the mediocre to the magnificent. Unfortunately, that’s not the reality for many using the system. A quick show of hands suggested perhaps two thirds of the delegates had first hand experience of the planning system. Of these, just one person found the process satisfactory. Why are many potentially beneficial rural development proposals considered guilty until proven innocent in the eyes of the planning system? The upfront financial risks, complexity and challenges of the planning process are constraining rural and community-led development. Not long ago, planners in one Council told me they rarely refuse planning applications for business development in the countryside. Businesses in the same area told us their enterprising ideas often don’t even make it to the planning application stage because the strict local planning policies put them off. New housing in the countryside can face an equally troublesome path, particularly in those Council areas where excessively restrictive policy is applied. Bizarrely, the remnants of London’s Green Belt policy, dating back to the 1947 Planning Act, cast a shadow over Scotland’s landscape. An aspiration to avoid coalescence of larger settlements and maintain access to the countryside for recreation, has morphed into a determination to keep the landscape free of development. Much of the landscape our planning policies strive to protect is deforested and barren, or man-made and managed at industrial scale for agricultural, sheep, deer or grouse. We’re told homes built here might ruin what is too often misunderstood to be natural wilderness. Reliance on car trips will apparently single-handedly render these homes unsustainable. If urban development had been given the same scrutiny, our towns would never have expanded. For decades, planning policy has sought to contain towns and cities, avoid sprawl, support town centres, reduce private car use and make good places. It has failed. Much of what has been built in the last 40 years has been suburban, low density, car-dependent, out of town-focused and dismissive of community and place-making. In other words, wholly and self-evidently unsustainable. Too often, the tab for failures arising from this market-led beano has been picked up by the public sector, through town centre regeneration projects, heavily-subsidised public transport starved of passengers, road repairs and the wider social, health and wellbeing impacts described so eloquently by Dr Harry Burns. We’ve had forty years of development approved in the hope that the private sector might deliver public benefit. Thatcherism began stripping back the public sector and that process continues unabated in the UK. The devolved settlement currently provides only a limited buffer. The public sector barely builds anything anymore. If it did, I think we’d soon see systems being simplified, as public sector users began to understand more fully the difficulties in getting anything built. Talk of simplicity resonated at the conference. The Planning Bill opens the door to extended use of Simplified Development Zones, where an approved zoning and land use approach can be taken. This streamlining is targeted at larger scale urban development but it might be shaped to suit rural areas and communities. On the subject of communities, the Bill introduces the notion of Local Place Plans. The community action plans some places have already adopted could be expanded and embedded in the Council’s statutory Local Development Plan. As things stand with the emerging Bill, it would theoretically be possible for a community landowner to adopt a Local Place Plan with Simplified Development Zone status. That sounds a lot like devolved democracy. It’s the kind of visionary change many planners say they seek. It’s just a shame that the Bill doesn’t set out to deliver that vision, it’s just a potentially cosmic consequence of other stars aligning. In reality, planning is generally conservative, lacks influence and has lost the skills it once had in the delivery of development. I began my career working at Livingston, where the public sector was building a new town. I didn’t care much for the results on the ground but the process worked in many ways. Land was purchased at agricultural value, access and services were provided, social housing and other buildings were constructed and serviced land was sold to the private sector at profit. Most of our European neighbours still seem to succeed doing things this way and they are building better places than we are. We need a new era of public interest-led planning and development. People should play a key role through Local Place Plans, community development trusts and community land and asset ownership. That doesn’t mean we forget about private sector development and asset or land ownership. It just means that public interest needs to be closer to the heart of planning and development. Where does this leave rural housing? In too many rural areas, we’ve been left with an abundance of poor quality, low-value housing, or large, high-value prime housing and second homes. This two-rung ladder has no chance of spanning the rural housing gulf. We need a combination of baby steps and giant leaps to deliver change. The Planning Bill will offer numerous opportunities to engage with the emerging legislation. The rural sector needs to take its chance. Don’t wait for a dedicated ‘rural-proofing’ Bill – start influencing now. It’s a simple concept: a little hut in the woods; a place to spend some time outdoors; reconnect with the real world. There are hytte all over Scandinavia and northern Europe, so why not here? It’s a simple building: made from local timber; maybe self-built; easily removed at the end of its life. And it’s one simple step to create the policy framework: add a concise definition of a hut to Scottish Planning Policy and watch the verbose hutting movement take physical form. Off we go then. We recently submitted a planning application for a pilot project by Reforesting Scotland, the group that’s done more than anyone to promote hutting in Scotland, through its 1000 Huts Campaign. Working with Forestry Commission Scotland on a site at Carnock Wood by Saline in Fife, Reforesting Scotland plans 13 huts, one of which is intended for educational use. We’ve tried to keep it simple. We helped Reforesting Scotland set out information for this kind of development in their guidance for “New Hutting Developments”, published in 2016. We’ve now sought to create a template through this planning application to make it easier for others to follow. The application documents can be viewed here. A quick look at the application file online and you’ll realise that simplicity only goes so far. 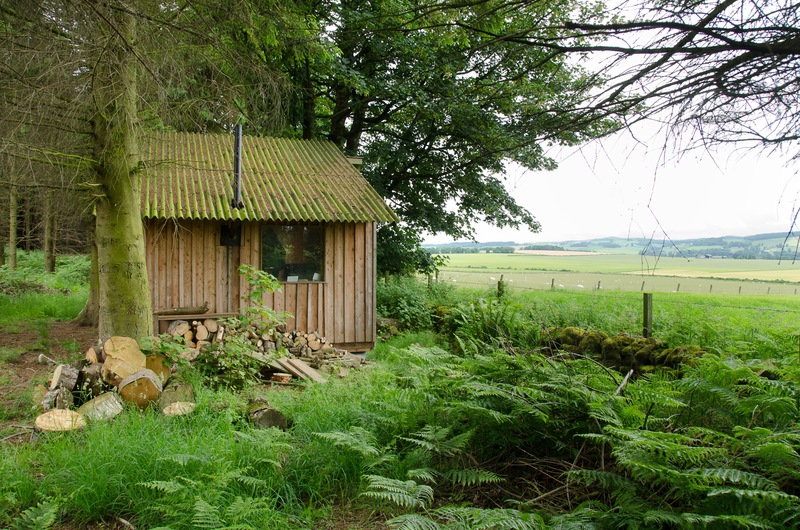 The planning system hasn’t handled many hutting applications in recent years, as there are so few huts in Scotland and barely any have been built in recent times. Planning authorities need to be confident that they aren’t opening the door to inappropriate development. They want to know what the huts will look like. They want to know about any potential impacts on ancient woodland, habitat and protected species, road safety and landscape setting, flooding and core paths. They want to know how people will travel to the huts, how they will use them, how the site will be managed. Sometime soon, a simpler planning application process may be possible. Once a body of hutting evidence has emerged, we can all campaign for a lighter-touch approach to the planning process, for this lighter-touch form of development. If Simplified Planning Zones are acceptable for housing and employment, then why not huts? For now, this seems like a big step forward. There’s more work to be done but the planning application takes us closer to making huts available for people who want them. And we know lots of people want them….